Dear job seekers, this is the biggest job announcement Gramin Dak Sevak Recruitment 2019. The Indian Postal Department is about to recruit candidates for the upcoming year. According to the latest news sources, there is an Upcoming GDS Recruitment which is expected to be the highest recorded number of Postal Department Posts. Read the updates given below for GDS Vacancy and start applying. Indian Postal Department is going to invite eligible candidates for various posts. The positions mainly will cover Gramin Dak Sevak under which the roles of Shakha Dakpal, Stamp Vendor, Mail Man, Dak Vitrak, Packer, and Dak Vahak are included. This is expected to be the biggest initiative taken by the Postal department and following these India Post GDS Vacancies, a large number of applicants is expected. In other updates, The Secretary of Department of posts announced that there will be a Recruitment drive which is going to be started soon. So please apply for this great opportunity. The Online Registration Started shortly for Gramin Dak Sevak Recruitment. Applicants are also hereby notified that they can only apply through online mode where they are supposed to fill their Application Form. For further clarification, please refer to the Official Notification link given at the end of this article. 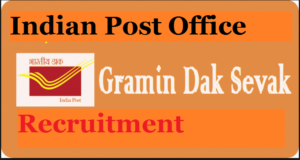 Available Positions Reportedly for Gramin Dak Sevak Recruitment: Category wise name of Posts: Dak Vitrak (Mail Distributor), Packer, Dak Vahak (Mail Carrier), Mail Man, Stamp Vendor, Shakha Dakpal (Branch Postman). Education Criteria: Based on the applied post, applicants must have at least successfully completed standard 10th, or 12th from a recognized Education Board. Candidates who belong to the category OC/OBC Male should pay a fee of Rs. 100/- (Rupees one hundred) at any Head Post Office. Aspirants who are going to make the payment has to visit any Head Post Office to make the payment. For making the payment candidate should inform Registration Number at the PO Counter. SC/ST/Female are exempted from Fees. Residence after Appointed for Job: All those aspirants who are selected for the post of Gramin Dak Sevak must mandatorily to take up his/her abode in the Branch Post Office village inside one month after getting the appointment letter. As per the expected notice, eligible age group to apply for these posts is between 17 and 30 years. Proper age relaxation will be granted to the candidates belonging to the reserved categories. For general category candidates, applicable charges are 500/-, for SC/ST/Female/PWD applicants it is Rs. 100/-. Payment Mode: Credit/Debit/Challan or Net banking. Salary to be offered is under consideration and will be notified first of all to the candidates here. Applicants need to check the official web portal for the relaxed state. All the necessary links are listed in the section below. On the homepage of the site, locate the Gramin Dak Sevak Recruitment 2019 notification link and read the advertisement carefully. Choose your work location and fill the form details. Upload the images of your documents and pay the fee amount. Fulfill all the required formalities and recheck the Gramin Dak Sevak Recruitment 2019 information before submitting it. Finally, submit the data and get a copy of your application form printed. Keep it for future use.